Discussion in 'Gameplay Discussions' started by anjapelu, Jul 23, 2018. Just wanted to send a suggestion here for a housing and job system that AIR could have. Im really a fan of open world mmos with a large scale system of life skills. I believe this can make the game MORE immersive and functional. First would be the housing system. I think the concept of being able to place houses and farms, or any other functional facilities in an open world game is the best system to go (this was done perfectly by Archeage). It differentiates the way players can "mold" the world rather than just having a kind of non existent space that opens up when you select a certain players house (this is what Black Desert online has which i really dont like). Now i understand that there could be issues with this kind of housing system such as land hoarding, but i believe it can be fixed. Placing a very VERY high tax requirements for players that are hoarding lands could work. Sure they can take as many land as they can, but having a tax requirement that they cant handle could eventually stop them from doing so (unless a player is hacking, which is cancer to any game and must be prevented as botting and hacking destroys a game). Another housing system i would like to suggest would be a sort of "apartment rental" system in large cities. Probably suitable for low level players (or casual players that dont really generate a lot of in game money). If youve played most mmos, usually city buildings are useless as they do not have any purpose other than for aesthetics. Black Dessert tried to make a different approach here and made the city buildings as spaces that players can buy. However, the immersion lost when they made the rooms intangible and that multiple players can buy that space and place their own stuff. I think its better if once a player rents that space, it will not be available for others, and any items/furniture he has in that space is part of the world, just like the houses players can place. With this system, towns and cities wont look deserted. Now for the job system, i like the idea of black desert where you can hire npcs to do tasks (ex. Farming crops, tending cattles etc). But what if AIR could take this further by also allowing actual players to apply as workers and and do the tasks? It would make the game economy more realistic. This job system may need more discussion as im not really sure whats the best approach on some of its aspects (ex. How will the workers get paid by the employer etc). These are just vague suggestions and having everyones feedback would really help improve this. I hope you guys like the concept. Lets start discussing! A:IR is already supposed to have some sort of an instanced housng system, where you can have a home, workstations etc. Myself, I am somewhat divided about housing in general - both on personal and large scale level. There are always some ways that may turn a system that looks fun at first into a loophole for exploits/grief or into an exausting grind. Seems fun, but instanced housing seems like a waste, because you are separated from the gameworld. Not instanced housing - not enough plots for everyone and if there will be, surely there might be performance issues somehow. Farming and NPCs working on your plots: botters claiming ALL THE PLOTS instantly to farm 24/7 all there can be farmed for selling off for some $$$. Or it turns into a super grindy grind because you need all the mats all the time to develop your character. I like the housing idea but its hard to decide between instanced vs part-of-the-world housing, as both have their good points and bad points. Not enough land vs not part of the world for people to see and explore. The not enough land part could be somewhat alleviated by restricting the number of buy-able plots per account but there is still the issue of number of active players vs the number of plots. Furthermore, in order to make it so land grabbers and bots don't take them it would have to be completely non profitable to do so. This is possible with making direct reselling unavailable. For example, in order to drop the plot you have to resell it to the "game" then it goes on cool down and then the player buying has to buy it from the housing system. This would make the player be forced to camp till it comes off cd and pay both the bot and the game housing system for the land. And this is assuming that someone else doesn't snag it first or something irl doesn't happen meaning they can't be on when its available. Overall this would make buying from another player undesirable. For farms and NPC's gathering or questing for you, making them unprofitable wouldn't be to hard just make what you farm either common enough or bound to you on pickup or valuable items rare enough to not be consistently profitable. FFXIV's retainer system strikes a good balance of NPC's gathering/questing for items for you and not being over profitable while also not being completely useless. Farms however have the problem of enough additional space to be worthwhile in an open world scenario which further limits the amount of land available. As for the idea of taxing the land, I'm against that, its a pain for a normal (casual) player to afford even a small piece of land in these kinds of systems, assuming they can find an open plot to begin with. Asking for further money, which can be hard to come by for a casual player is unreasonable. It is far better to make it unprofitable for bots and land grabbers than to make even small things unavailable or hard to get/keep for certain parts of the player population. When all is said and done for an open housing scenario, whether it be instanced or open world, it comes down to dissuading botter's as much as possible while providing an adequate balance for players to want to go after it. It is a tricky balance to strike and maintain but doable with enough thought and effort. Well, I thought a bit about the housing system. Since there is already some sort of personal housing planned, I just offer some thought on what I think would be interesting to me. First and foremost - I would like to see a more fantastic design of personal housing rather that just a regular "realistic" house. What was shown about A:IR's housing in terms of design was simply boring IMO. To make it even more fantastical than just a house under a giant tree, which is growing on a floating isle, the houses themselves could maybe be made from some shells of giant snails or molluscs. Would certainly fit the lore of a catastrophy shattering the planet and its shattered pieces now randomly floating around. I am not at all excited about the prospect of having to rely heavily on some (literal) farming mechanics. First and foremost because of bots and hoarding, and second because that would disencourage players to travel around the game world to do their daily business and thus make the world less alive than it should be. On the other hand, if there are some plants and materials in not too significant amounts to collect around your house that make your life just a bit easier, this could be pretty nice. In the first line I see this as a personal space to put all of your visually impressing assets into one place: your ships, your mounts, your pets and possible NPC followers and all of your characters, too. 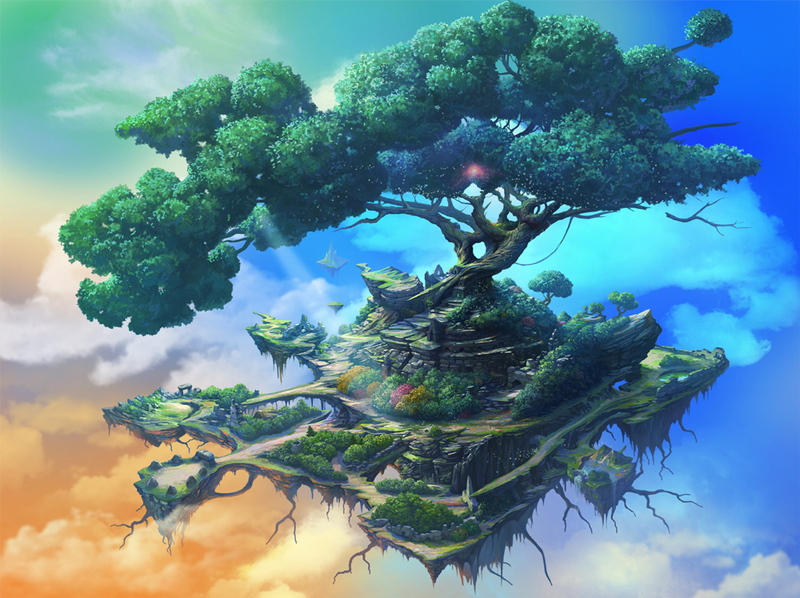 Your loading screen's background could actually be this isle, showing off your ships and the tree house/village. As mentioned above, there could be some useful plants growing on it - in small amounts - that would make your daily gaming life *a bit* easier, nothing major, just something nice to have. Maybe you could put an NPC or one of your characters to tend some of the plants for a very small bonus and just as a small nice visual detail. 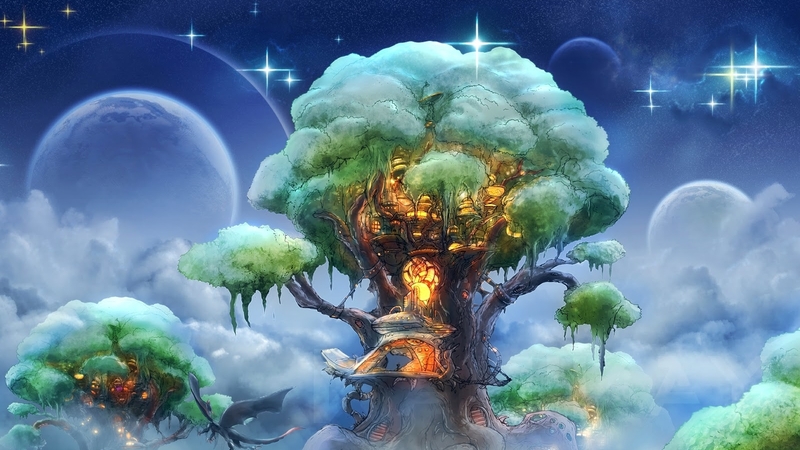 The humanoid NPC characers(your own characters + others) would mostly stay around the tree and maybe use some tools, smithy etc and possibly follow a general day and night cycle. From time to time, a random flying mechant could appear and offer some goods to buy - either some rare (cosmetic) stuff or useful things like ingredients at a reduced price. This is mostly a small nice detail to liven your home a bit(including some NPCs from your isle doing some barter with the merchant). In general, I think it would be a pretty cool idea to let your isle population grow with the amount of your playable characters and their total average level. For example, upon reaching max level and after completing some achievements, your character might take/gain an apprentice/follower who would join to live on the isle. NPC gunners and NPC ship crews would stay on your isle, too, maybe working on/around the ships during the day. Expanding your isle by chaning smaller isles to the central big one might be not a bad idea. 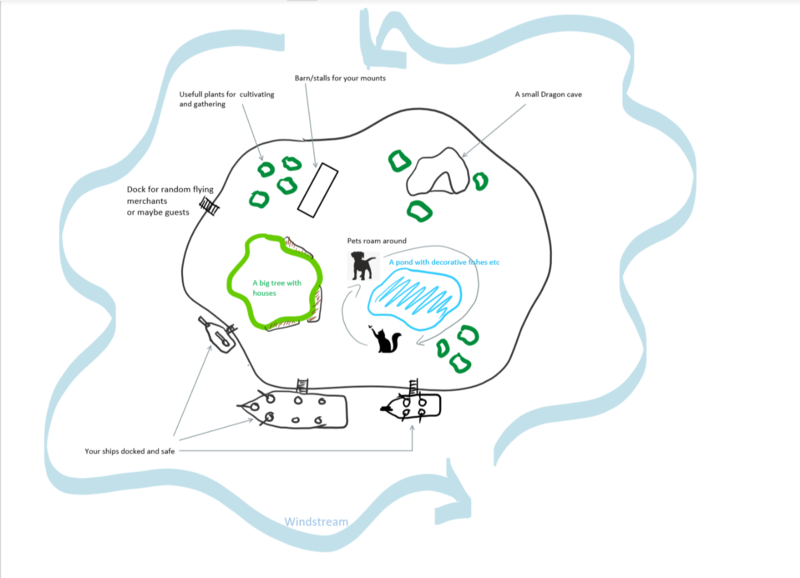 I for example could imagine that you could build a small observatory on such a smaller isle, which then could harbour a quirky old hermit watching the skies for some meteorites or smilar stuff coming down and marking the corresponding place on your map for you to visit and see what you would find. You maybe could watch through the telescope yourself to check out the surroundings of your home and maybe discover some ressources on some distant rocks floating around etc. As mentioned before, I am not excited about the prospect of your home being just a place for a farm and workstations. I guess there still will be farms and workstations, but there also should be something that is fun to do around your ingame home. Also, sometimes directly after loggin into the game, I feel like I need some sort of a quick warm-up before doing any more "serious" content. Sometimes the wait for instance or the group forming draws out a bit too long and doing something simple but fun would help against boredom. It is easy imaginable that from time to time you would like to just use your personal wings and fly around. 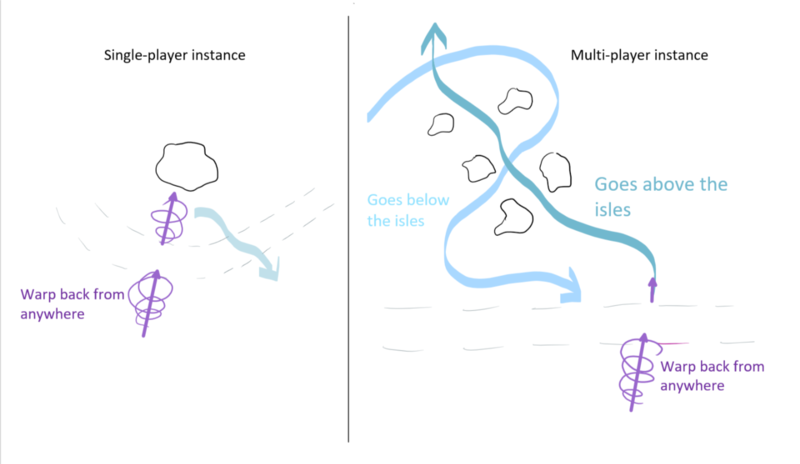 To make it a bit more fun, I suggest adding some windstream around the isle, so that the higher speed inside the windstreams makes flying a little bit more intense for a short while. You would then maybe use this opportunity and check out some random floating rocks around your home isle to see if there are maybe ressource or some mobs to hunt. Each day(or any other cycle of similar or shorter duration) the rocks around your isle would change in size and position to keep things a bit more random. In some cases maybe you would encounter a stronger monster and fly your mech suit over there to battle it to keep your mech skills up to date. Let's assume there is a body of water below your isle - ocean, sea or large lake. From time to time the magical fishes living in it would jump out of the water for a couple of seconds, float around a bit and jump back, for whatever reason. Your objective would be to catch the fishes by suprise while they are floating in the air. You would need high speed and a spear to do this - and a flying battle mount, like a Badass Battle Dragon for example. You would then dive down from the isle towards the water surface to gain speed and then would have to set the course properly, react and aim quickly to catch the fishes when they jump out of the water or those floating around before they would notice you and try to escape back into the ocean. After you would do some passes over the water, the fishes would wisen up for a while and stay below surface. Fishes themselves could be a useful ingredient or maybe some sort of a consumable for your mounts or anything else of some use. - Depending on weather conditions the windstreams might change their course a bit, so you would get a different flight trajectory. - When flying inside a windstream during foggy weather to check out the isles, you might get caught in a hidden spider web and would have to fight some spiders. - Sometimes when spearfishing, some random huge creatures would jump from below ocean's surface and try to eat you, so you'd have to pay attention. - You might see a merchant ship in a distance that would get attacked by some random monsters(or small pirate boats). Head out to help the mechant(or maybe kill everyone and collect some loot) and maybe invite him over to your isle and get some heavy discounts - and maybe a quest to find out where the pirate mothership is located and to destroy it in some part of the world. - A sneaky goblin has stolen undergarments of the hot elven maidens living on your isle. Equip your shiniest and whitiest armour and then pursue and punish the perpetrator! Or maybe not! Maybe you decide first to head over to your observatory and consider the... assets... at your disposal and... assess... the wholeness of the situation, just like the quirky hermit living there usually does it! Choices, choices! As mentioned before, I am split about the housing being instanced or not. At all times I'd expect to have full control about who can enter my isle and have the means to remove guests at will. Also, in each case what it absolutely needs is at least the feeling to be connected to the rest of the game's world somehow. 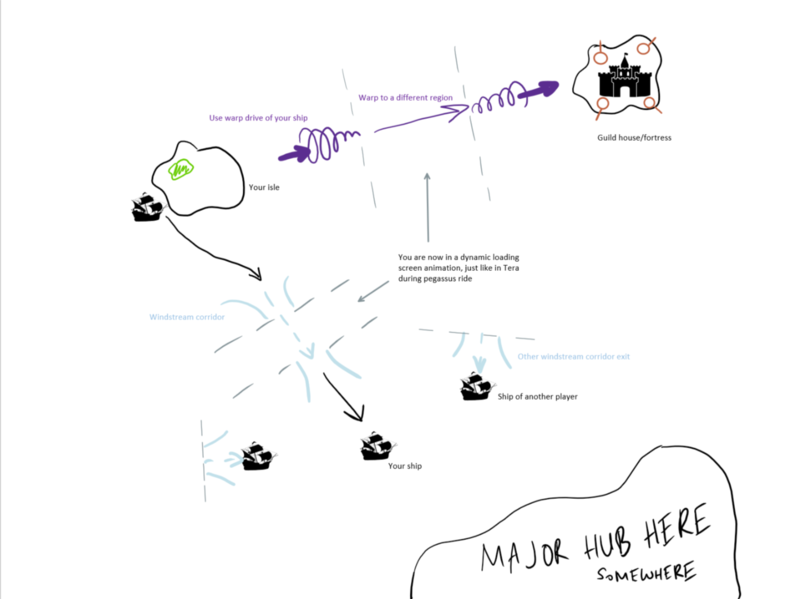 The primary way to do this, is IMO to let the a major hub be visible in the background, so that you get a feeling being at least geographically close to where many other players are. Alyria, Shari, Crisco and 1 other person like this. Why are you so sure about this? As mentioned above, I think it is important for immersion reasons to provide some sort of a more direct connection to the rest of the world, no matter whether you home is in an instanced area or not. I think windstreams-like mechanics are pretty good for that, too, as they fit pretty well with the world of A:IR where airships and flying are common. Let's assume for a start that the player's floating isle is instanced. As mentioned, I think it would be pretty nice if a player could use his ships or mounts and hop into some sort of a windstream originated in his home instance to seamlessly and immersively travel to a major hub that is geographically somehow supposed to be connected to the general area where the player's home is suposed to be. The transit could work just as the pegassus rides in Tera do, where instead of a boring loading screen you could get an immersive animation of you traveling on your ships inside a windstream towards a certain exit location. 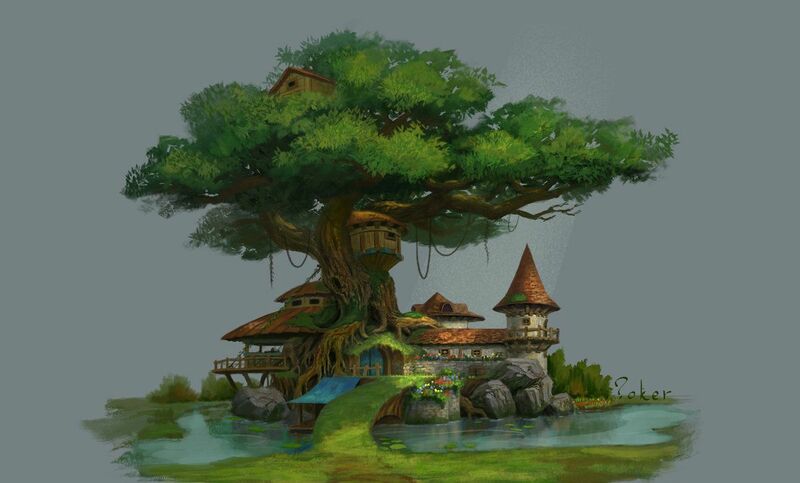 The other thing I think could be nice is to connect such a home instance/area to possible guild houses/conquerable fortresses, where players would be allowed to use some sort of a special jump/warp drive on their ship and jump directly to the area, where their guild's home is. As long as a special device -something comparable to stargates from sci-fi maybe? - would be installed and instact inside/near the guild house/fortress, such jumps would be possible. Player ships would exit in some distance from the guild houses/fortresses, maybe also taking the general direction of the area where they came from into account, and fly the last bit the conventional way on their ships. I think this would be pretty nice for possible sieges and add to the general usefullness of owning and/or conquering some sort of a fortress as a guild. I think it would be pretty sensical to let players warp back their ships to their homes from anywhere(including some sort of a spool up/casting time for pvp/pve balancing purposes). For multiplayer home instances it would be pretty nice for immersion purposes to have some windstreams, so you can cruise around a bit when leaving or coming back, but still be quick while doing so. Maybe this could even allow for players to move their homes together either geographically or into a single instance if they wish to do so. I.e. friends or simply guildmates would maybe like to choose to cluster together, so to say, for whatever reasons. Take note on how StarWars Galaxies did there housing system . If your not aware look into it. You could place a house or building or machaniry anywhere in the game world outside city limits. The only down side to this is well there isn't one. Player made and operated cities with purpose that's the way to go. Instanced housing is lame by all accounts. For example swtor,wow,bdo,rift,wildstar ect.. all forms of an instanced housing system but nothing compares to non instanced housing. Make the game world big enough to accomdate server channel size is the key there should be more then enough land to place houses = problem solved. You could also implement a limit to how many homes a player can own and how tightly packed they are. Another way to limit the number of housing is by requiring relatively flat land to place the house. Also a payment system could be implemented like in archeage you don't pay then your stuff gets mailed to you and your land is up for grabs.. I haven't played Archeage or Star Wars Galaxies, but about a week ago I decided to visit WoW again and played a bit with its Garrison mechanic. I thought it is at the basic level a fairly fun idea. I especially liked that you get a choice in what you can build in your garrison space and that the structures were fairly useful during the expansion the Garrison was meant for. Upgrading the garrison and recruiting new followers was also pretty nice, too. If there will be fortress raids in A:IR and the fortresses will be held by specific guilds/entities, I think it would be interesting to imitate the building placement mechanic from the Garrison. Guilds could maybe be able to build and upgrade several structures around and inside the fortress to provide benefits to visiting players and also to taylor the defensive mechanics to their liking, adjusting their defense strategies according to the defensive structures they would use. Imagine giving players the opportunity to individually adjust the body/face of their home NPCs and dress them up in their own costumes - that is a lot of additional demand for costumes and character remodel tokens and probably a nice income boost without messing anything up in regards to gameplay. Something similar could be made for guild homes and conquerable fortresses: if players would be allowed to place some of their followers from their home instance there and show off their costumes, each guild would probably try and show their own visual style, with the most prestigious guilds maybe even competing with each other in terms of original visuals. Might end up as a total freak show, though, lol. Did anyone catch the Twitter post about housing? What I got from it is that it will not be instanced and kinda be like first come first serve basis. Hope there are enough houses to claim. Some fantastic housing concepts and mechanics are outlined here. I especially enjoy the idea of floating cities around the world. 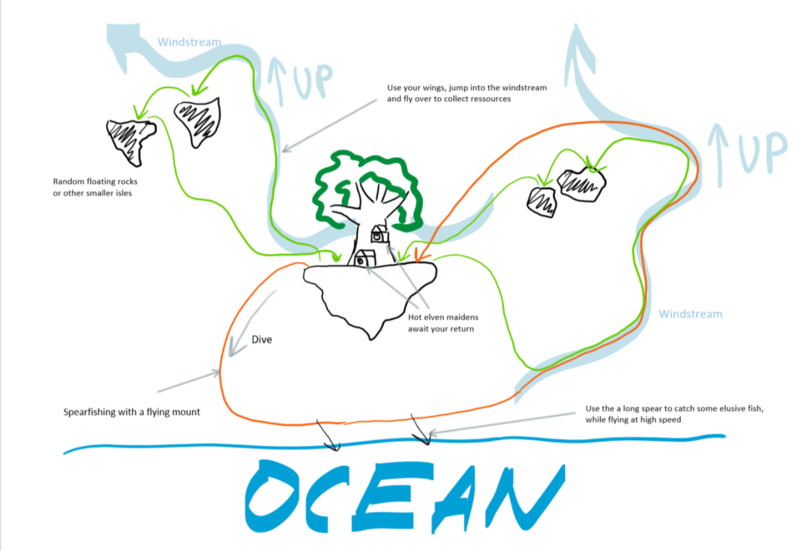 The theme of A:IR along with the world makeup (from what we know by the map) would allow for a plethora of real estate to use these floating islands. What concerns me is the world becoming far to crowded with islands that the skies loose their maneuverability. When it comes to the 'first come first serve' method of housing, I hope the A:IR crew establishes a fair policy (at least in the beginning during the rush). The idea of some sort of limit was mentioned earlier in the thread and I fully support it. Maybe a plot size / limit per account / per server? After the rush, depending on server population and housing availability they could lift the restriction? it just 'exists' in open world. Which correlates with my impression of what that tweet meant.